Best Covered Bridge? Readers Say Elizabethton Covered Bridge! 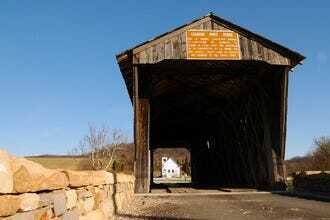 The earliest documented covered bridge in the U.S. was built in 1805 in Philadelphia. These structures quickly became popular as a way to prolong the lifespan of a bridge, and at one point, there were as many as 12,000 in the country. The Elizabethton Covered Bridge is one of only four remaining covered bridges in the state of Tennessee. Built in 1882, the 134-foot Howe truss bridge still carries pedestrian traffic across the Doe River. One look at Virginia's Humpback Bridge and you'll understand its name. Built in 1857, this 100-foot bridge across Dunlap Creek is four feet higher at its center than at either end, giving it its distinctive shape. 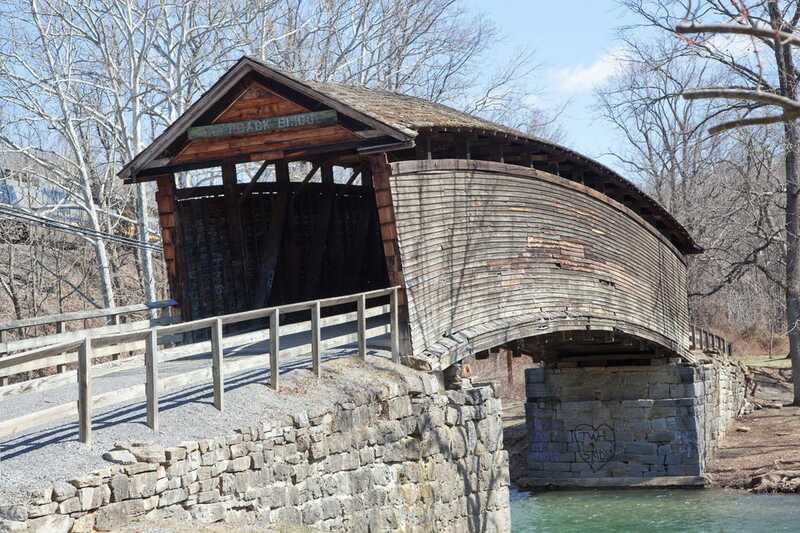 It's also Virginia's oldest remaining covered bridge. Built in 1935, the Horton Mill Bridge is one of the nation's highest, crossing 70 feet above Alabama's Black Warrior River. 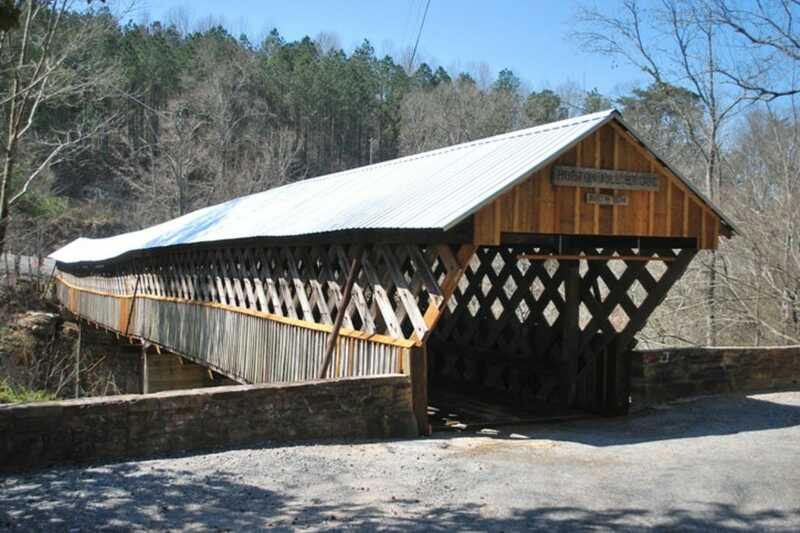 The two-span, 220-foot Town lattice truss bridge was the first covered bridge in the Southeast to be added to the National Register of Historic Places. 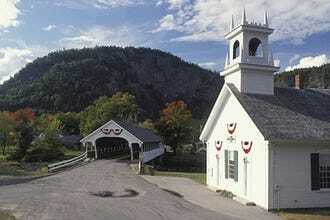 Built in 1862, New Hampshire's Paddleford truss-style Stark Bridge crosses the Upper Ammonoosuc River. The two-span bridge measures 134 feet long. This photogenic bridge was almost replaced by a new steel bridge in the 1950s, but public outcry saved it, leading to its restoration instead. Today it's listed on the National Register of Historic Places. Built in 1825, Hyde Hall Covered Bridge is the oldest remaining covered bridge in the nation. The 53-foot-long Burr arch bridge is situated on Otsego Lake in Glimmerglass State Park. 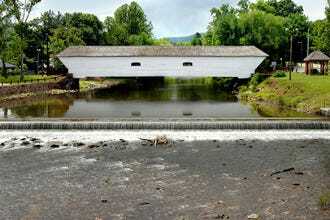 It's also one of only three covered bridges in New York to use horizontal siding. West Union Covered Bridge was built in 1876 as the third bridge on the site. The two-span, double Burr arch bridge is the longest remaining (315 feet long) in Parke County – the Covered Bridge Capital of the World. 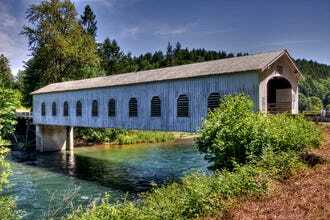 Oregon's most popular covered bridge, Goodpasture Covered Bridge stretches for 165 feet across the beautiful McKenzie River. Built in 1938, the Howe truss bridge is the second longest covered bridge in Oregon and continues to carry vehicle traffic. 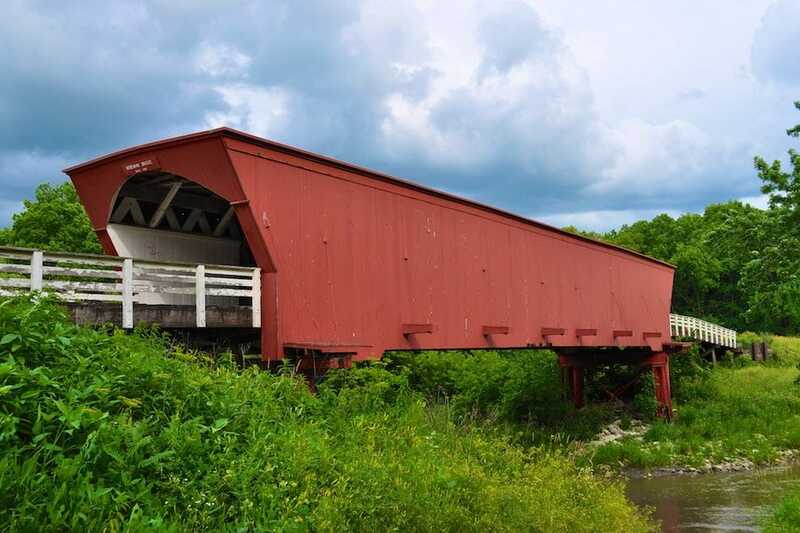 Made famous by the novel and film The Bridges of Madison County, Roseman Covered Bridge was built in 1883 at a length of 107 feet across the Middle River. 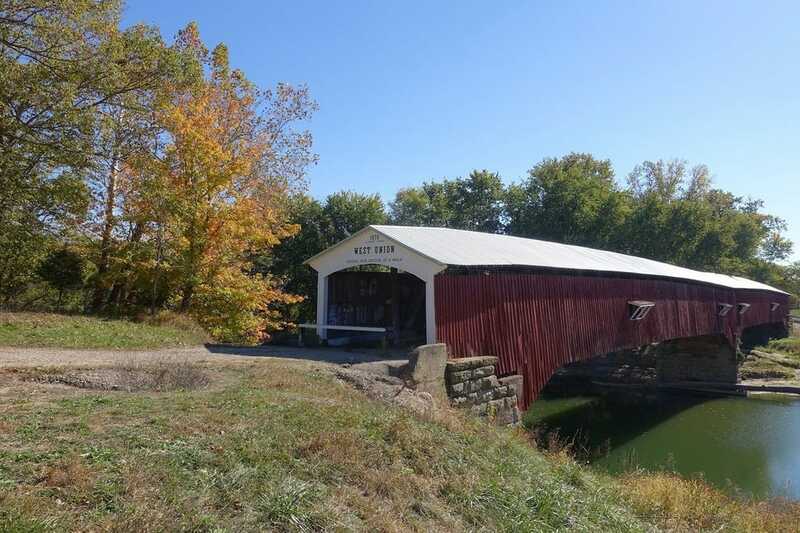 It is one of six remaining bridges in Iowa's Madison County and is also reportedly haunted. Spanning 100 feet across Marsh Creek in Gettysburg, Sachs Covered Bridge is a Town truss-style built in 1854. It's considered Pennsylvania's most historic covered bridge, and if local legend is to be believed, it's also haunted by the spirits of Confederate soldiers. By the 1950s, when the National Society for the Preservation of Covered Bridges was formed, that number had dropped to under 1,500. 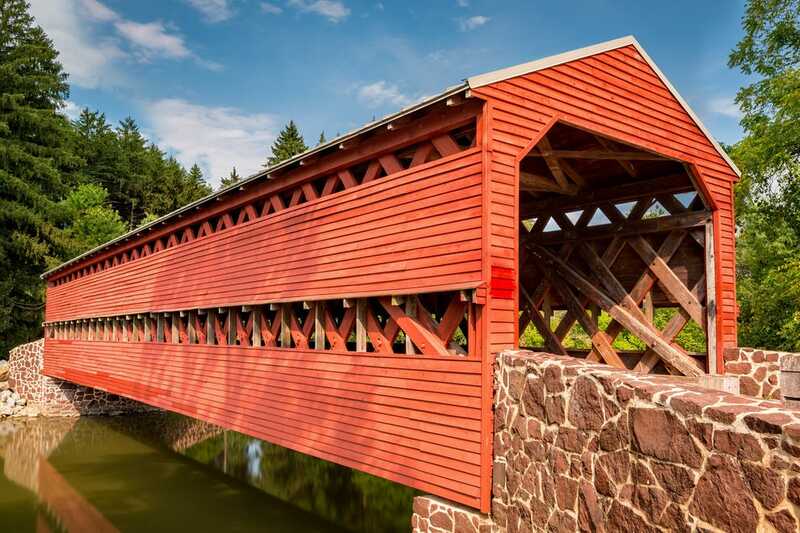 We asked a panel of covered bridge experts, as well as our network of Local Experts, to nominate 20 exemplary historic bridges for the category of Best Covered Bridge. For the past four weeks you – our readers – have been voting daily for your favorites. Elizabethton Covered Bridge - Elizabethton, Tenn.
Goddard Covered Bridge - Flemingsburg, Ky.
Humpback Bridge - Alleghany County, Va.
Horton Mill Bridge - Oneonta, Ala.
Stark Bridge - Stark, N.H.
Hyde Hall Covered Bridge - Cooperstown, N.Y.
West Union Covered Bridge - West Union, Ind. Goodpasture Covered Bridge - Vida, Ore.
Sachs Covered Bridge - Gettysburg, Penn. Other bridges nominated in this category included Arlington Green Covered Bridge, Campbell’s Covered Bridge, Cornish–Windsor Covered Bridge, Dreibelbis Bridge, Flume Bridge, Knights Ferry Covered Bridge, Pengra Covered Bridge, Sunday River Bridge, Wawona Covered Bridge and West Cornwall Covered Bridge. Next time you're on a great American road trip, make sure to check out one of these beautiful covered bridges near you. 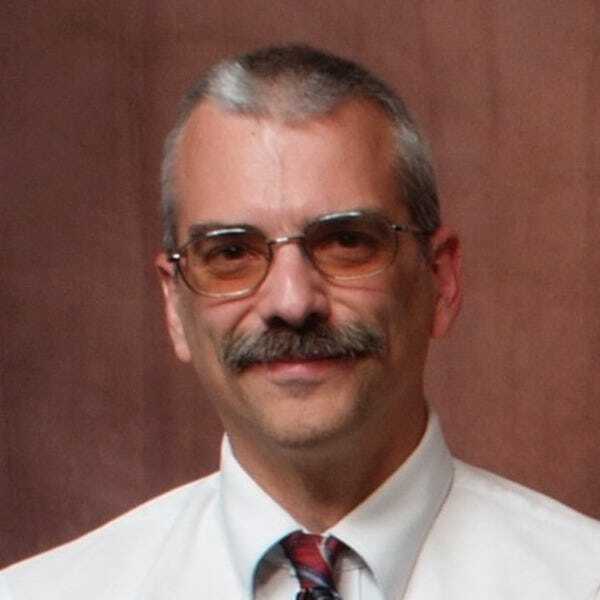 Bill Caswell is president of the National Society for the Preservation of Covered Bridges. The Society was founded in 1950 to raise awareness of the needs of America's historic covered wood-truss bridges. 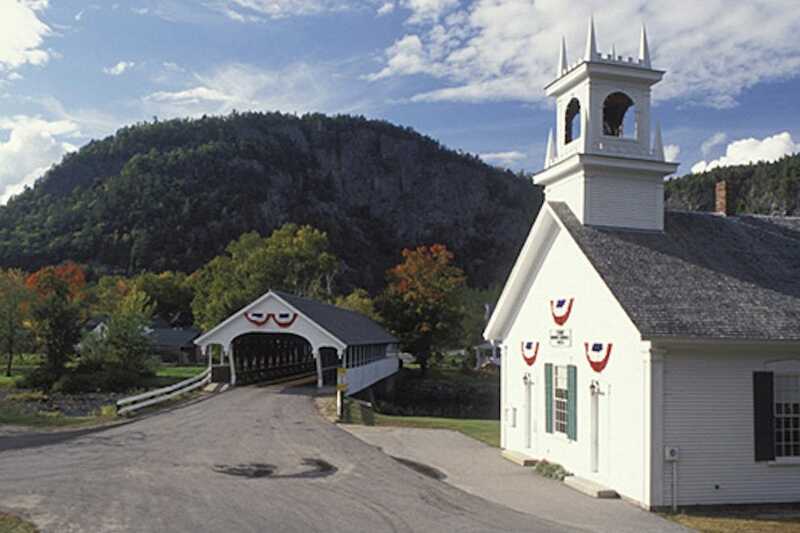 It stresses the importance of adhering to proper historic preservation practices such as those in the Burlington Charter for the Preservation of Historic Covered Bridges and Secretary of the Interior's "Standards for the Treatment of Historic Properties". 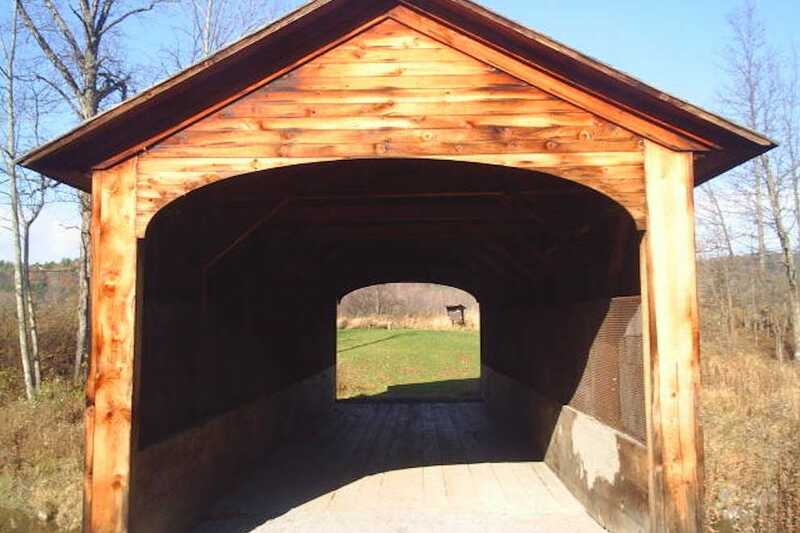 Bill authored Connecticut and Rhode Island Covered Bridges and co-founded Covered Spans of Yesteryear, a website documenting over 13,000 current and former covered bridges of the Unites States and Canada. Trish, along with her husband Bob, have been actively pursuing Covered Bridges and educating the public in regards to their preservation since 1993. 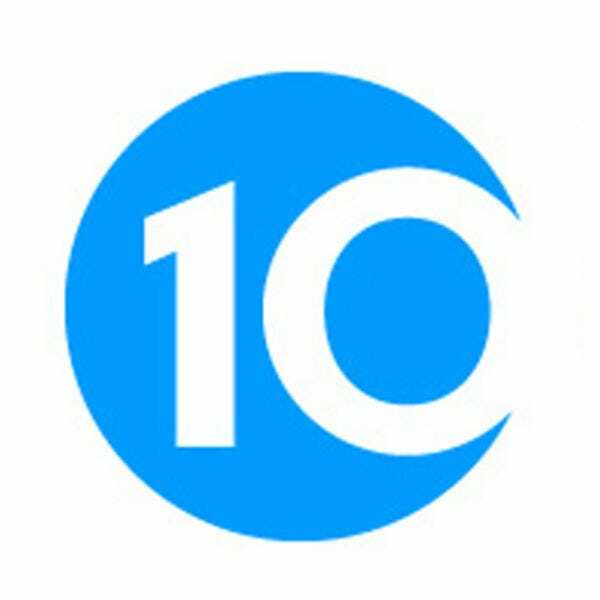 She is a co-founder of Covered Spans of Yesteryear, a website documenting past and present covered bridges across the United States and Canada. 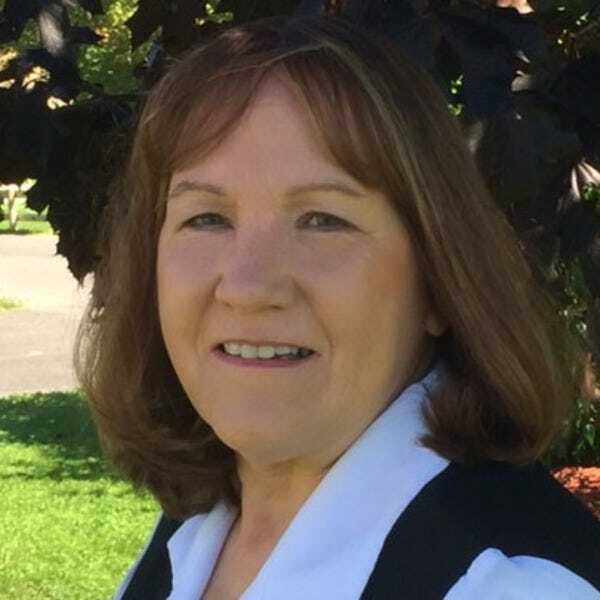 Trish recently published a Driving Tour of New York’s Covered Bridges and in 2014, along with her husband, co-authored, New York States Covered Bridges, a book featuring current covered bridges in New York State. Presently, Trish is the Collections Curator for the Theodore Burr Covered Bridge Resource Center in Oxford, NY.